The HPI Nitro Star 3.5 engine is now equipped with 2-needle composite carburettor. This redesigned engine, with two needles instead of three, makes it much easier for beginners to set up and tune. The new composite material makes the engine run smoother at all temperatures. The Savage 3.5 RTR is ready to run, equipped with a high quality 3-channel radio (prepared for reverse module). Only a few steps are required to start the car for the first time. 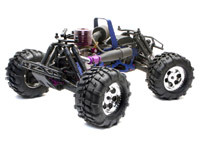 The enclosed HPI RC-Car DVD is the perfect introduction to Nitro powered RC-Cars for all beginners.